Driving through Powai is an exercise in patience at the best of times — the twirling dust, black, due to the pollution, vehicles vying for every inch of open space on the road, and people filtering through this mess covering their faces with handkerchiefs. Just a few metres away, in the waters of Powai lake, the going, perhaps, is even slower; but in an entirely different and in a very, very good way. Ignore the vehicular sounds, lower your gaze from the skyline that’s marked by fancy buildings, and you’d almost forget this is Mumbai. For anglers at the Powai lake this is very easy — you could also say it is necessary. Thin, bright and straw-like, the peacock feathers keep bobbing in the water mysteriously. Follow the rod it is attached to and you will find yourself peering into eyes that are intent, and alert. For when the peacock feather dips into the water, it indicates that a fish is touching the line. The angler rips the line hoping he will hook the fish. “This is what you wait for — hours together, and sometimes for days. The feeling you get when you hook a fish is incomparable,” says MA Ghani joint secretary of the Maharashtra State Angling Association, and an avid angler for more than 30 years. But that’s only the start. The fish puts up a mighty struggle before it is “landed”. “The strength of the fish in water is unbelievable,” says Ghani. A big fish can empty the whole line out. The trick is to tire the fish. Let it swim for a bit, and then roll the line back. Judgment comes with experience. Get it closer to you, slowly, and then net it. The action lasts just a few minutes, but the thrill lasts several hours. 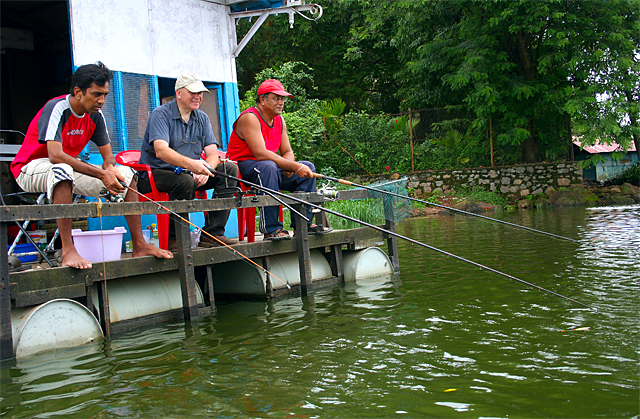 But anglers spend most of their time sitting calmly in machans. Patience, after all, is a key ingredient in angling. A hawk swoops to catch a fish, a water spider skirts on the water, a fish splashes somewhere — “You tell me… where in Mumbai can you see such things? Can you imagine a place like this in any other major city? Just sitting over here is enough to relax,” says AH Husaini, secretary, MSAA, who prefers to spend 36 hours of his weekend by the lake. Sitting in the machan, you feel as light as the breeze, as pure as the air you‘re breathing. Watching the water’s gentle rhythmic movement, you’d almost think that it’s not the water, but the machan that’s moving: The oneness with nature is complete. And Husaini’s point is driven home: Is this really Mumbai? 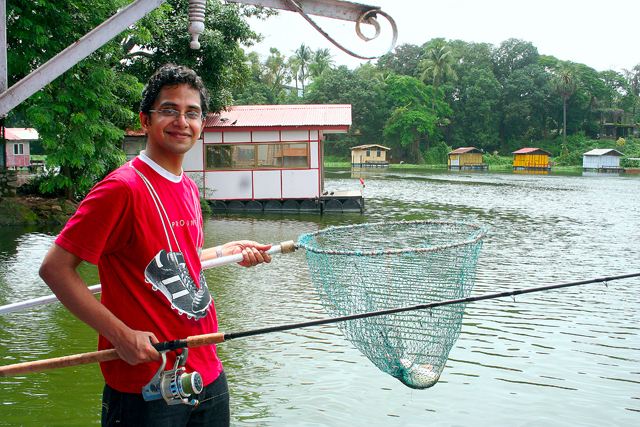 Ahmed who has been angling for four years is relatively a beginner. But the more experienced members at the lake haven’t yet caught anything for the day. Angling doesn’t work by such rules. This entry was posted in City Tales and tagged adventure sport, angling, fish, Mumbai, powai. Bookmark the permalink. Have a Better Day! in America. Go Trout, Bass or Steelhead fishing! Plant Irises, Roses & Tulip flowers in your garden! Play in the park with the kids! Leave wherever you are a better place than when you arrived. Perform well at work, focus, and add value. Plan out your lifetime investment allocations, be knowledgeable. Baslee Troutman wishing you healthy, happy and prosperous travels.